Knitting stitch patterns are so fun to knit. I really enjoyed creating this page because it gave me a chance to try out some stitch patterns I've been curious about. Make sure to have a ball of yarn and needles handy because I am sure you'll want to try some. The best way to find out if a stitch pattern is easy, is to try it. Sometimes a stitch pattern will just make more sense as you knit your way through it. And a lot of times they're surprisingly simple. I have also created a page for you to look at about reading stitch patterns and understanding about knitting multiples. It may help you understand before you start looking at all the pattern stitches. I'm starting off with two very basic knitting stitch patterns beginners will learn first. They're very simple to knit and are the basic stitches that will form all the other knitting stitches you make. 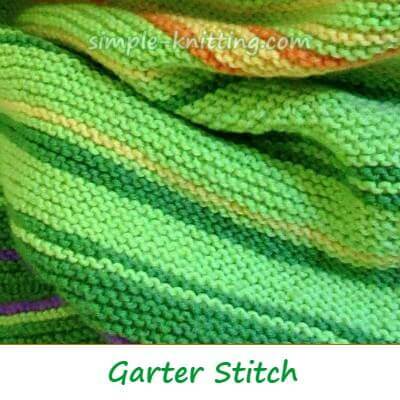 Garter Stitch is the most popular stitch pattern and the easiest stitch you'll learn. This picture is a section of my temperature blanket. It's all done in garter stitch and as you can probably tell I love knitting with it. When you knit every stitch on every row it's called garter stitch. has a square knitting gauge so you'll need to knit twice as many rows per inch than stitches per inch. To count the rows in garter stitch all you do is count the ridges by two. Each ridge equals two rows of garter stitch. 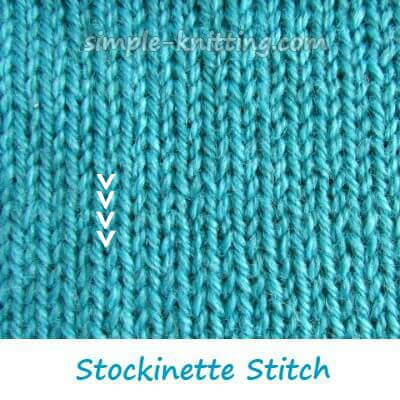 This is the Stockinette stitch pattern which is also called Stocking stitch by some knitters. It's very simple to knit and it's timeless and used for so many knitting projects. 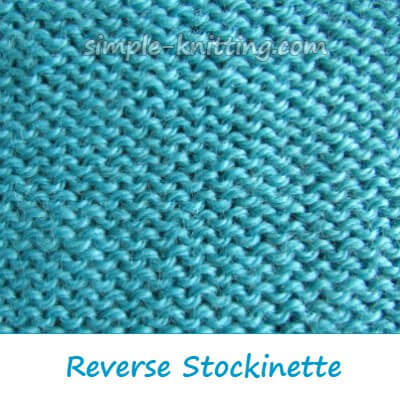 Stockinette stitch is formed by knitting one row and purling one row. See how the knit side creates a nice smooth surface and you can easily see the knit stitches on the front side or right side (RS) of your work. And notice the smooth side creates little V's? I outlined them to show you how well defined they are. Those are knit stitches. When you turn the stockinette stitch pattern over you will see lots of purl bumps on the picture below. This is the purl side. On some knitting projects this will be the wrong side of your work. This is also called Reverse Stockinette and is a knitting stitch pattern too. You'll find many sweater patterns that use it and other knitting projects too. If you are working the reverse stockinette stitch pattern the purl side will be the right side and the knit side will be on the wrong side. It curls and it's not your fault! Basically it curls because there's a difference between the size of the knit stitch and the size of the purl stitch. Knit stitches tend to be a little shorter and narrower than purl stitches. It doesn't matter when you're knitting a pattern with both knits and purls together however when you knit an item that's in Stockinette you'll see it curl. Theres a couple of things you can do to help tame the curling. You can knit a small border in a different stitch pattern like garter stitch or possibly ribbing or seed stitch. This will help keep it flat. And you can also just let it curl and this will create a rolled edging to your knitted piece. It looks really nice too and you'll see it on hats or the bottom of sweaters and ever necklines. Now that the first knitting stitch patterns are done I hope you enjoy trying these lovely stitch patterns. These knitting stitch patterns are simple combinations of knit and purl. The best thing is they are really pretty and fun to knit. Andalusian Stitch: This is really pretty and so easy to do too. Basketweave Stitch: This knitting stitch pattern is so nice and it's really easy to do. Of course there are pattern variations so I decided to show you a couple. After all it's always nice to have choices. Diamond Brocade: Elegant, pretty and so easy to knit. Seed Stitch and Moss Stitch: These stitch patterns are timeless and really simple to knit. Seersucker Stitch: Wow! This is pretty. Twisted Stockinette: A nice change from the classic stockinette stitch. Waffle Stitch: This is just lovely. Rib stitch patterns are a wonderful way to create texture in your knitting and more importantly they create some elasticity in your fabric. Here are a few ribbing stitch patterns to take a look at. I have started with the most common rib stitch patterns. Basic rib stitches: These rib stitch patterns are the basics to learn because you'll find you use them a lot. Would you like a little more adventure with ribbing stitch patterns? If you would, take a look at these. Some are easy and some get a little more challenging. Just have some fun with them. Diagonal Rib Stitch Pattern: This is quite simple to do and looks so pretty. Seeded Rib Stitch: One word, beautiful and easy. Ok three words. Get started with knitting cables. You can do it. Or at least have fun trying. Basic Cables: Knitting cables is fun and these basic cables are easy to knit. Mock Cables: Easily knit a cable stitch look with these gems. OXO Cable: So fun and sentimental too. Here are a few of my favorite lace and eyelet stitch patterns. I will be adding more stitch patterns over time. I just love them, so keep checking back often.